Chad has experienced chronic instability since its independence in 1960 and was heavily affected by conflicts in neighbouring countries like Sudan, the Central African Republic, Libya and more recently Northern Cameroon, Nigeria and Niger (Boko Haram conflict). The high influx of refugees from Sudan and CAR into Chad in recent year has become a protracted situation with long-term implications. Refugees and host communities are challenged to live together and improve their livelihoods. Chad is one of the poorest countries in the world, ranking 186th position (of 188) on the Human Development Index. 55 per cent of the population live in poverty. The majority of the Chadian population does not have access to social protection, health, education, justice, employment, and good governance. The country is often affected by natural disaster such as droughts and floods. More than four million people are food insecure, with nearly one million is even severely food insecure. Due to continued unrest and insecurity in the region, in the near future a large-scale return of the refugees living in Chad to their home countries is very unlikely. The LWF works together with refugees and host communities to help meet urgent and long-term priorities. We distribute both food and household items to refugees and Chadian nationals displaced from the conflict in the Central African Republic. We empower communities to improve their livelihoods through agricultural support and vocational training. We work to strengthen the rights of women and children, and prevent sexual and gender-based violence, particularly in southern and eastern Chad. Because of the negative effects of war and violence, we promote psycho-social care to help communities recover and become more resilient. To create peaceful co-existence, we assist host communities with capacity building and social infrastructure to support them in welcoming refugees in their living environment. LWF is particularly involved in remote and vulnerable areas where local potential and adequate services are lacking. Agriculture and livestock: LWF reinforces farmers in agricultural techniques, provides farming tools and improved seeds. LWF also advocates for more refugees to receive secured farming land. For persons keeping livestock, the LWF facilitates vaccination campaigns and veterinary care. Environment protection: The influx of refugees has impacted on the fragile ecosystems in the host communities. LWF organizes awareness sessions on environmental protection, LWF also set reforestation areas, distribute enhanced ovens to save firewood and install machines for making combustible bricks, to further reduce the need for firewood. Vocational Training Center offers a variety of trainings on woodwork, masonry, electricity, mechanics, soap making, agricultural and livestock, plumbing and sewing. At the end of the trainings, trainees receive equipment to set up their own business to generate income and create job opportunities for other members of their communities. Income generation activities: LWF provides loans to the communities to run small businesses. LWF reinforces skills and organizational capacity of business groups to promote self-employment and entrepreneurship. Help us make a difference in the lives of people in need in Chad and other places throughout the world. LWF General Secretary Rev. 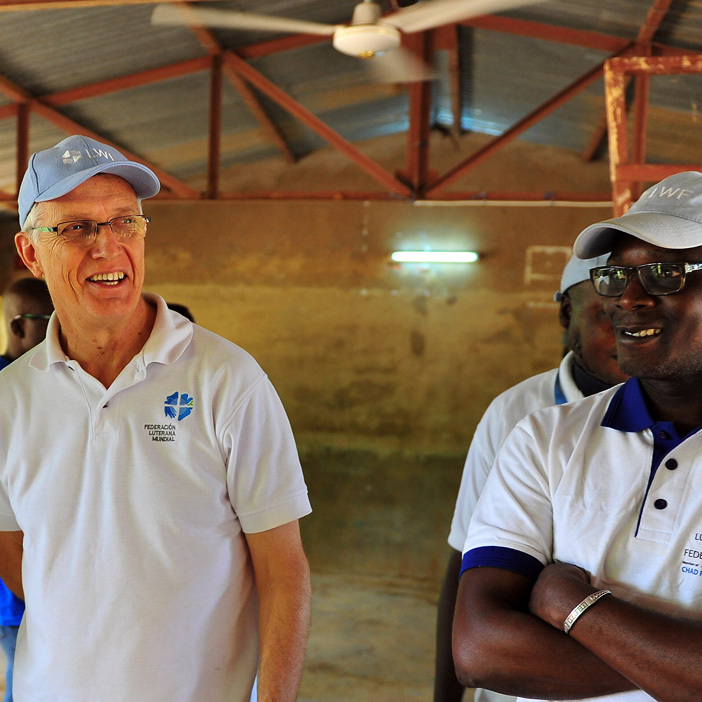 Dr Martin Junge has visited LWF programs in east Chad, the first such visit of a General Secretary to the country. Junge was in Chad from 11-18 December to see the places where the LWF works, encourage staff, meet refugees and host communities and raise awareness about the country’s protracted refugee and forgotten humanitarian crisis.